Our body is composed of 60 percent body fluid. It's a combination of water and ions. When we exercise or do something productive or just about any activity, we lose water and ions through perspiration. But we may not be aware of it but we might just have what they call spontaneous or involuntary dehydration. It happens when drinking pure liquids make thirst disappear but spoils our body water and electrolyte balance. Pocari Sweat Ion Supply Drink has the closest profile to our natural water. It goes beyond satisfying our quench for thirst. It replaces what we lose properly and effectively. It replenishes lost body fluids quickly and prevent involuntary dehydration. Pocari Sweat is quickly absorbed by the body as it contains the ideal balance of glucose (sugar) and salt. It is your first aid drink to prevent dehydration and immediately address low ion levels. Low ion levels in the body may further lead to organ failure and in some worse cases, even causes death. As a blogger/freelance writer, it's either I am always on my toes covering events/food reviews or working on my ipad mini at home sitting on couch in my usual slouch posture or down on my bed--which aren't exactly what you could consider as healthy lifestyle. Too often, my being "in the zone" for writing could also be a disadvantage for me because I'd often forget to hydrate myself. And this is where Pocari Sweat Ion Supply Drink comes in. 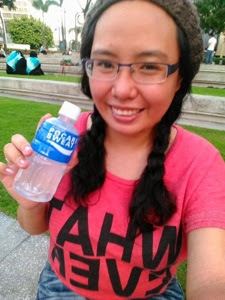 Fellow blogger Dems Angeles likes Pocari Sweat Ion Supply Drink too. To be perfectly honest, I'm no fan of energy health drink simply because I find them either too sweet or too bland for my taste. Well, such thinking has changed since I've tried Pocari Sweat. 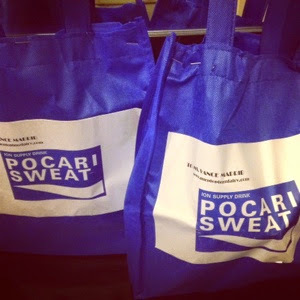 I became an instant convert because of Pocari Sweat! 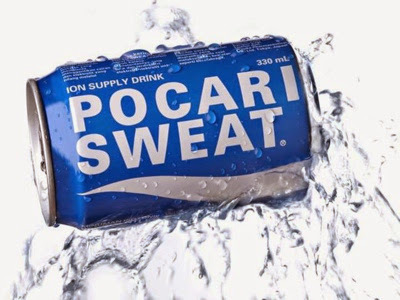 For those who do not know yet, Pocari Sweat is a mild tasting refreshing drink that helps in replenishing body fluids lost through perspiration. I like Pocari Sweat because it's very handy, it does not have any artificial color (it actually looks like water) but do not underestimate its looks. Its got a sweet and citrusy or tangy flavor that's actually nice. My Japanese friend, Miki Shinohara said that in Japan, when one becomes sick, they'd feed him with Pocari Sweat as well because they believe it will make him well faster. 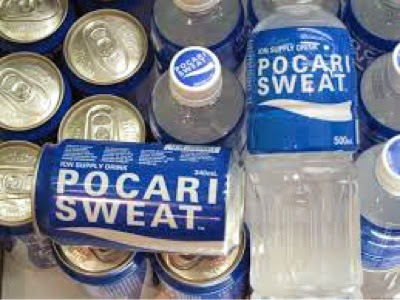 I guess the Japanese wouldn't have these beliefs if they weren't able to experience the wonders of Pocari Sweat. So whenever you feel like you're perspiring too much or at the point of dehydration, load up a bottle or a can of Pocari Sweat and you'll feel a whole lot better. Remember Pocari Sweat is your first aid against dehyration. This is your next bet besides Oral Rehydration Solutions. People who should drink Pocari Sweat should have an active lifestyle such as people who work out or play sports. Not for people who have sedentary lifestyle.